No other method has so much scientific support to confirm the reversal of the ageing process as TM. Transcending is doing something very special with body and mind. All 600 studies that were done into Transcendental Meditation are showing in their own way, that there is a process going on, that is the exact opposite of the ageing process. Tensions will more and more tend to disturb the normal functioning of the body as they accumulate and it is said, that this is one of the main causes of the ageing process.Transcending deeply rests the system, so providing the basis for the removal of these tensions, thus reducing the everyday ‘wear and tear’ on the system and so effectively reversing the aging process. As incredible as this may sound, it can be confirmed quite easily, and this is exactly what happened in the research. By measuring several variables, scientists are usually able to predict your age quite accurately. 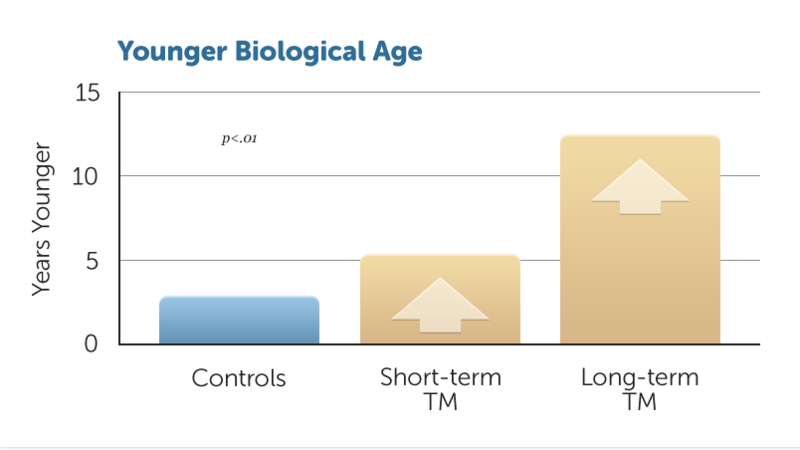 In other words, the “biological age” as it can be measured, corresponds for most people with the chronological age. Someone who is 55 years old, on average, will also function biologically as someone who is 55 years old. 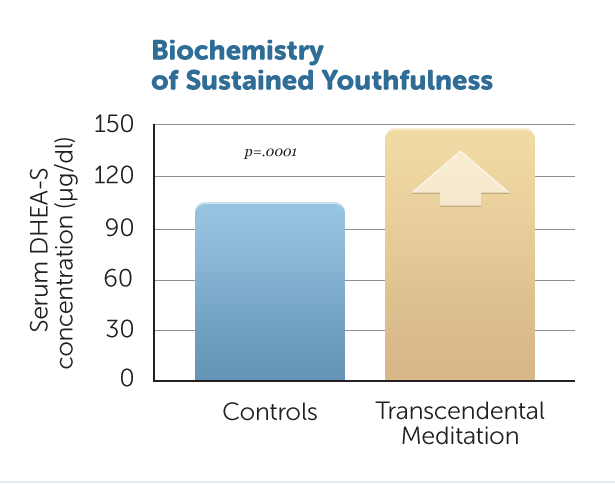 In the same way, one can measure objectively whether Transcendental Meditation practitioners are effectively becoming younger and by how much. A study with 84 subjects showed that TM practitioners who have practiced the technique for 2.9 years on average, are 5 years biologically younger than the norm. Long term practitioners, who, on average, were using the Transcendental Meditation technique for 7.1 years, were biologically even 12 years younger than their chronological age would predict. Reference: International Journal of Neuroscience 16: 53–58, 1982. So we could say that the time we will invest to practice Transcendental Meditation (2 times, 20 minutes per day), will give us a very big return on investment later in life. Not only do we live longer, but also the quality of life will be better. There are other ways to measure the degree of aging, which is confirming the rejuvenation effects of TM. One can measure the level of a substance in the blood, plasma dehydroepiandrosterone sulfate (DHEA-S), of which it is known, that it slowly decreases after the age of 20 years. Higher values of this substance are related to a better health and to a younger biological age. For more research into the rejuvenation effect of TM see rejuvenation research.